The Internet may appear simple on the outside as we can simply type a URL and access our favourite side, connect to our favourite apps and download content, but what’s under the hood is far more complicated. There are so many technologies involved in each element of any website or online service. Tech companies spend millions of dollars in developing something as common as secure login. Once such very useful technology on the Internet is FTP. We all have downloaded files off the internet but we might have never heard of FTP. FTP is File Transfer Protocol and is a file sharing technology used by servers to share files. Many content sharing servers use the technology of FTP to share files. FTP was initially built as a command line interface for servers but now it can be used on desktop computers such as Windows and Mac as well. All you need is an FTP client. With and FTP client on Windows and Mac, you can download files from any FTP server by a few clicks. Here, in this article, we are going to list the best FTP client software for PC both Windows and Mac that you can use to download files hosted by any FTP server on the internet. List Of Best FTP Clients Software For PC. 1. FileZilla (Windows & Mac). 2. Cyberduck (Windows & Mac). 3. Fire FTP (Windows & Mac). 4. JSCAPE (Windows & Mac). Given below is the list of best FTP clients for Windows / Mac. You can choose nay clients out of these according to your liking to download files from any FTP server. FileZilla is one of the best free FTP clients which is available on multiple platforms. It is easy to use and offers so many features. Filezilla can meet all your file transfer needs online as it supports FTP, FTP over SSL/TLS (FTPS) and SSH File Transfer Protocol (SFTP). You can work on IPv6 networks easily using this free tool. Other features include bookmarks, tabs, drag and drop, and pause resume for large files. Cyberduck is your perfect client to connect to various servers and drives. It supports almost all protocols and technologies such as FTP (File Transfer Protocol), SFTP (SSH Secure File Transfer), WebDAV (Web-based Distributed Authoring and Versioning), Amazon S3, Google Cloud Storage, Rackspace Cloud Files, Backblaze B2, Google Drive and Dropbox. Although it supports all the protocols, it is designed to work with FTP in its core. Hence, it has a well-tested FTP client system that supports FTP over secure SSL/TLS connections. 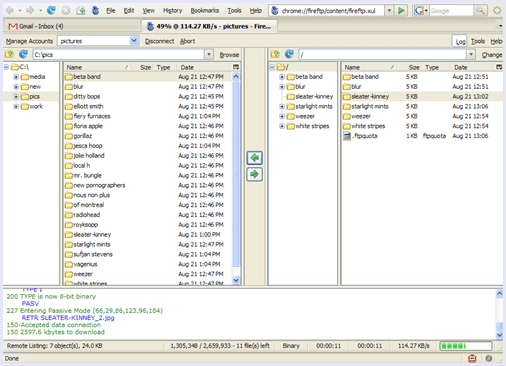 FireFTP adds the capabilities of a fully functional FTP client to the Mozilla Firefox browser. Hence, it can work on nay platform that supports the Firefox browser add-ons. It offers SSL/TLS/SFTP support for full encryption of your files. Apart from the IPv6 support and the regular file transfer features, FireFTP boasts synced directories, remote editing, compression, timestamp mapping, drag and drop and proxy support. Jscape is an international company that deals with professional file sharing services for organisations. It has many tools in the file sharing field and also offers a free FTP client for almost all platforms. It offers a feature loaded FTP client for Windows and Mac. The anyClient FTP supports all major file transfer protocols including FTP/S, SFTP, WebDAV/S, Amazon S3 and AFTP (Accelerated File Transfer Protocol). You can commercially purchase this tool in order to be embedded in web pages and applications. 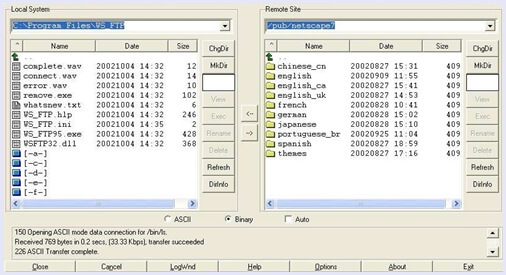 WinSCP is an open source free FTP client available only for the Windows platform. It offers a great user interface with proper Windows integration. There is support for SFTP and SCP protocols over SSH and FTP and WebDAV protocols along with Batch file scripting and command-line interface and .NET assembly for advanced programming tasks. WinSCP also offers encryption support and directory synchronisation. 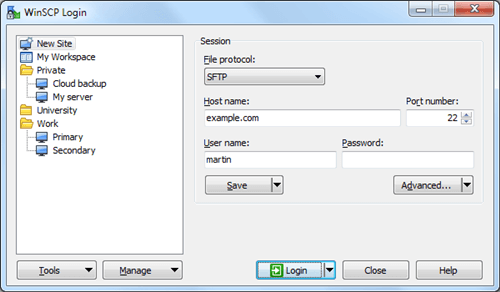 Another feature of the FTP client is that it can save site logins and protect it with a single master password. FlashFXP is a paid FTP client for Windows. Hence, is is a very high-performance FTP tool for serious and professional people. The tool is aimed at performance and reliability. It offers on the fly compression and works great with multiple small transfers. The client is very secure with Secure FTP (FTPS) using SSL/TLS, New SSH File Transfer Protocol (SFTP). S/Key password encryption, application password protection, SSL Site-to-Site (SSCN) transfers and Clear Command Channel (CCC) support for SSL/TLS FTP connections. The interface is pretty neat and offers all the usual file operations, drag and drop, synchronisation, proxy and more. WsFTP is another top of the line premium FTP client for Windows. There used to exist a free lite edition for the client, but now it has been retired and only the paid version is available. WsFTP is very secure with OpenPGP encryption and in transit via SFTP (FTP over SSH) or FTPS (AES 256-bit encryption). It also supports File integrity checking using SHA-1 or SHA-2. FIPS 140-2 certified protocols. There are multiple connections supported over FTP, FTPS, SFTP, SSL, SSH and HTTPS/S transfer protocols. It also auto restarts failed transfers and being a paid tool, there is a great support from the developer as well. 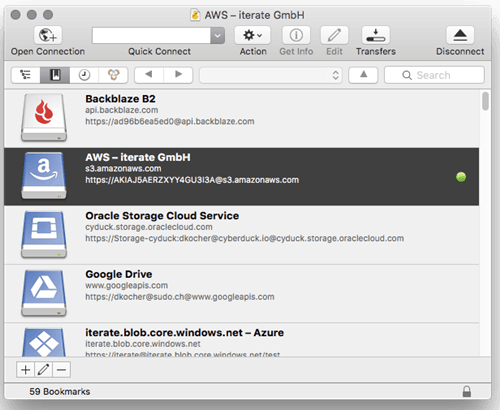 Yummy Software offers two versions of a very good FTP client for Mac. The first is a lite version offered at $9.99 with all the basic downloading and FTP file management tools. The lite version supports FTP + SFTP + FTPS protocols. The second version is a pro version available at $29.99 and has many advanced features. It supports powerful technologies like FTP/S + SFTP + WebDAV/S, along with features such as auto backups and more. Next, on the list, Fetch is also an interesting FTP client option for Mac. It comes with a 15-day free trial and can be purchased later for $29 and can be upgraded for $10. It supports FTP, SFTP, and FTP with TLS/SSL (FTPS) and is compatible with virtually all FTP servers, including VMS, VM/CMS, OS/2, Chyron, and more. Fetch also offers all the expected features of file downloading and management. CaptainFTP is a premium FTP client for all Apple products such as iOS and MacOS. You can purchase it at a cost of $29. Captain FTP supports FTP/SSL-FTP/SFTP along with the latest file transfer protocols. You can find all the required features present in this client of drag and drop, virtual folders, archives and more. It also supports built-in viewers for various type of commonly used files. Hence, these are the best FTP clients fro both Windows and Mac. In conclusion, we hope that you like this list of best FTP client software for PC Windows and Mac OS. If you feel we missed nay of your favourite FTP client, tell us in the comments below so we can review it too.